About a month ago, my fellow blogTO writer and photographer Joseph documented the strange winter phenomenon that is urban snow mountain making. I suppose a lot happens in over four weeks time, because the massive snow mountain near Kipling station has melted down a bit but more surprisingly yet is that it's undergone a major colour change from white to dark brown. And this isn't an April Fool's joke. 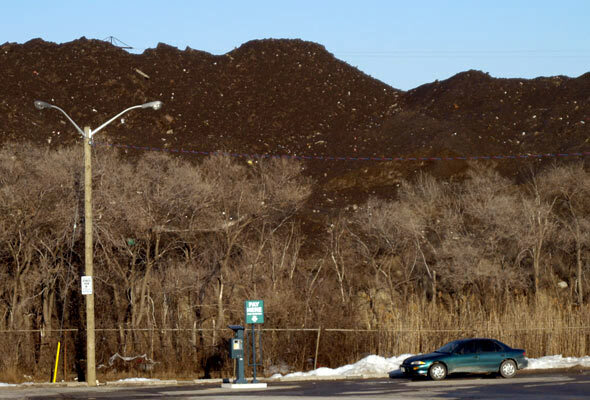 That's right - the brown heap depicted above, that looks like a giant mound of soil is actually nasty, dirty snow that's been collected from locations in and around the west end of Toronto. As you can see here, the thing is still huge. I put it at about 50 feet tall at its highest point, and have estimated it's area on this Google map. Just for fun, let's see who can predict the date (without going over) when the complete melt of this big brown mountain occurs. I'm going to throw out a (totally uneducated) guess of May 8th. Make a comment below, stating the date at which you think the mountain will see its final day. I'll head over there once a week to check up on things, and as it gets smaller and the weather warmer I may visit it more frequently so as to not miss the final moment of the snow mountain's existence. I'll let you all know when it happens, and announce the winner. Winner gets bragging rights and the glowing admiration of your fellow blogTO readers. It's still there, and still huge. It's still there, and still huge. It barely looks any smaller than it was in the photos above, taken on April 1st!